Continuing to be motivated by Malign Portents and with the promise of a game at the local store on Friday, my resin vampire and scenic base jumped the paint queue. This older sculpt is still quite nice, if perhaps a little different in terms of art direction compared to my newer Death miniatures. While a little chunky in places, it does have some great features like the cloak of bats and lower armour panels in particular. Taken as a whole, I feel the miniature works really well and remains quite evocative. It combines in its own unique way a great sense of arrogance, as befitting a vampire, with a less serious and somewhat over the top style – thick dramatic blood, extended tongue, head thrown back to the sky. Because of those elements, I thought I’d build the scenic base as a comic mockery of vampiric pride – no heroic scene opposing a Herald of Nurgle for Lord Casim. Instead, he lives out a daily existence of slightly perturbed annoyance, dealing with a mischievous and intractable infestation. A sort of Groundhog Day, but with Nurglings. For me this is about trying to create a sense of wry amusement at Casim’s imagined attitude, as he returns home to his crypt from Nulahmia during the events of the book Lord of Undeath. The miniature itself is largely painted in the same way as my other ‘Nagash’s Legions’ models, with some tips from Duncan on painting pale skin and the Nurgling mixed in. It was a bit more troublesome than usual getting full paint coverage in the deepest recesses given the combination of resin and priming white, but I got there with a few extra layers and a final coat of matte varnish. Overall I’m very happy to have him out there as another leader option and reckon he fits in well, while also lending some of that arrogant charisma to the force. Nice work. 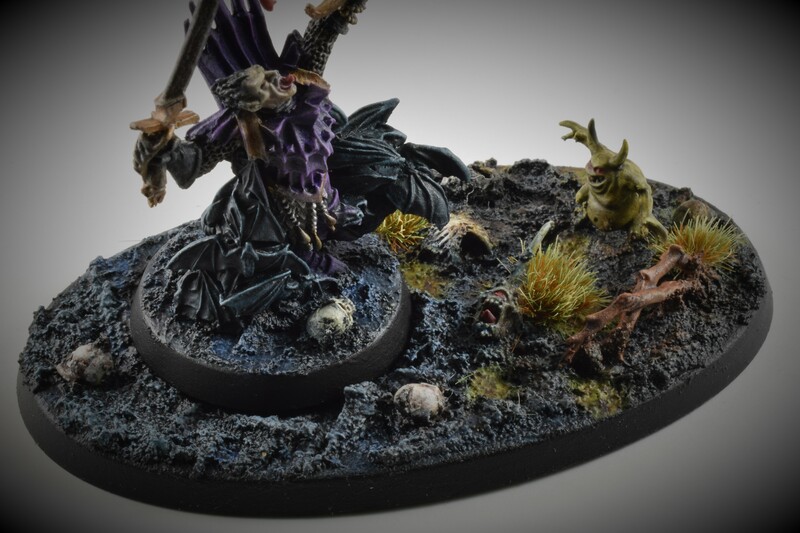 The scenic base creates an amusing little story for the Vampire Lord.